Hello lovelies! 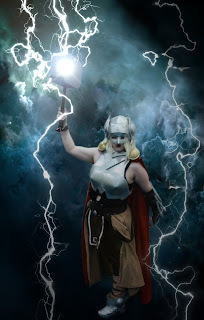 Time to finish up my Thor tutorial! Last time, I walked you through how I made my armor. This time, everything else! Let's start at the top and work our way down. My wig was one I had already. It's from Arda wigs, however they recently revamped all of their wigs and no longer offer the one I got. But, basically, you just need a blond wig. Makeup! Thankfully, it's Halloween season! Which made getting black lipstick (finally!) super easy! If you don't have black lipstick, you can use body paint, or eyeliner. Lipstick is just easier. Shirt. For her shirt, I actually made my own pattern by wrapping myself in plastic wrap, covering that in duct tape, and drawing my design. Then, I cut it out, transferred to wax paper with a 1/2" seam allowance, and sewed together. I used a black fabric that had a sort of faux leather look, but was see-through, and lined it with regular black lining fabric. Pants. I used Simplicity Amazing Fit 1696, utilizing the average fit pattern. No alterations to this pattern. I used a black pleather fabric, which was a pain to sew, and some scrap nonstretchy fabric I had lying around for the pockets, fly, and waistband. Pleather tip: have plenty of plastic bags handy and sandwich the pleather in plastic to make it glide through your machine better. Skirts! I whipped up a basic waistband (make it yourself, or utilize one from a pattern) and then pinned the fabric, using pleats, until I got the look I liked. For the dark brown bit in front, I made a paper pattern, tested the sizing, then sewed. Get some trim you like, and make the design. Cape. I actually utilized a cape tutorial I found, and just made the shoulder attachments a touch narrower. Also, I added velcro and left out the elastic arm holes. Tutorial here! Belts. I splurged on my belt and used real leather. I made a paper template, tested it, then cut it out of my leather. I used googly eyes painted black then silver for the details. Grommets along the back edges, and leather string to lace up. Also used the leftover leather to make the loops. Leg wraps. I hate leg wraps. I wrapped my leg in plastic wrap, covered in duct tape, drew my design, then cut it out. I used that as a pattern for my wraps, adding in 1/2" seam allowance. Cut from fabric. Then, using the light tan fabric, I cut strips and laid them over the wraps in random patterns. When I liked it, I pinned in place, and sewed. Then, add a zipper. Mine were a little big, so I also ended up adding some elastic to the top to keep them snug. The zipper I had on hand was too long, but these go into the boots, so I just fold it up inside the wrap. Didn't have any problems with it. And finally, the hammer! First, get some super thick foam board. Create a template for your hammer. Cut out multiple's of your template from the foam until you reach the desired thickness. Glue together (I used contact cement). Use paperclay to cover the sides and hide any unevenness. Sand. It does not need to be super smooth, but it shouldn't be lumpy. Measure and mark where your handle will go. Cut out. I used a circle cutting drill bit. Paint. I used valspar stone spray paint in manhattan mist. This stuff is incredible! Glue in your handle. I used contact glue. Then, cover handle in leftover leather. Make sure to create a hand loop. Hello lovelies! Sorry it's been so long. But I'm back! 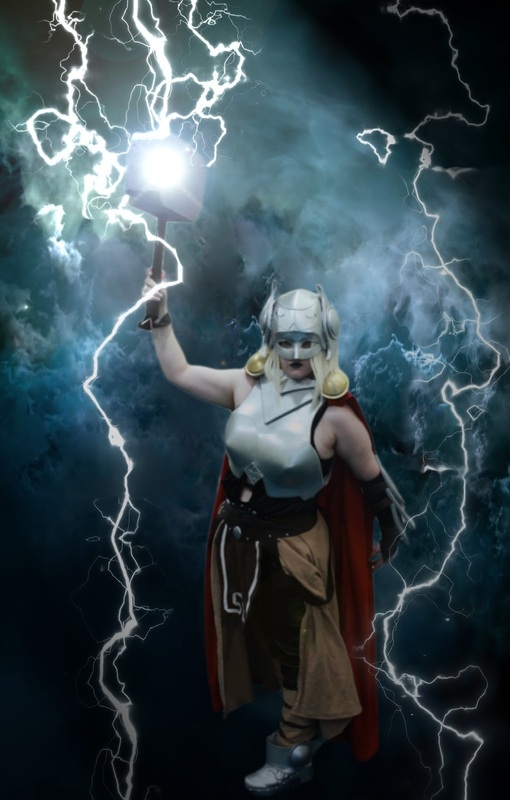 So, this is tutorial is going to be a walk through of how I made my Thor armor, as well as links to the youtube channel I utilized for technique. I highly recommend you watch the youtube videos first, then come back to my blog. Evil Ted, foam armor genius! Evil Ted has numerous videos. I watched basically all of them, even though some of them didn't really apply to what I was making (or so I thought). Seriously, watch them all! There are techniques he uses in all of them, and sometimes a tutorial you assume won't work for you (male foam armor), will (used a technique in that video for my bracer). On to the walk through! Now, right off, I got super discouraged because my first chest plate didn't look very good. But I did some research, found Evil Ted, and my second attempt was much better! Alright! I'm going to assume you've watched those videos and are ready to start!. First, wrap yourself in plastic wrap, cover in duct tape, and draw out your pattern! Use this for your base (not the triangular bits). Use the templates you just created to make your armor. Follow Evil Ted's tutorial for creating templates and gluing armor. Now, for the triangular bits at the top, I created a rough draft on paper, held the armor up to test size/fit, a resized if necessary. For the circles, I used the bottom of a glass as a template. Now, the circle bits have a raised portion. I attempted to make this out of foam, but was unhappy with it, so I ended up finding giant googly eyes and using those. So some of the pictures will have the foam cone, others the googly eyes. Also do the diamond detail at center bottom. Now, use the tutorial (EvilTed) for smoothing the seams. For the back plate, I used the same technique as the front, except I made it one large piece. I made these templates separately. It would probably be easier to do them at the same time, but lesson learned. After your seams are filled, prep with glue coats, then primer. Then paint. Helmet! Man, the helmet was a nightmare for me. The first one was terrible. The second was better, but not quite right. I was able to alter the second one to get my third and final helmet. First, watch the video for making a helmet. Next, with help, cover your face with plastic wrap, then duct tape (or paper tape). Use that template to cut and glue your foam pieces. I used EVA foam for the base of the helmet. My second attempt used craft foam for the face plate. Later, I cut that out and used a mask I got at the craft store. Now, I couldn't keep my blade sharp enough, so my gaps were pretty big. I tried using Evil Ted's smoothing method, but my cuts were so bad, it wasn't working. Therefore, I covered the entire helmet (minus face) in bondo and sanded for days. 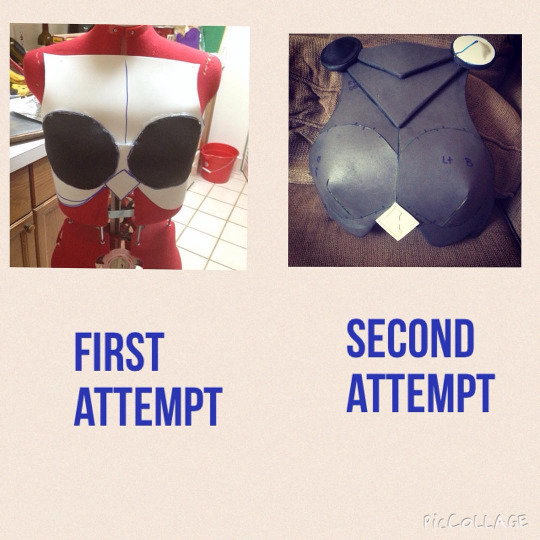 I also had to use bondo for my chest plate for the same reason. Next, add your details. Because I had to bondo my helmet, I did the mustache looking detail as a raised element instead of a recessed element like it should have been. The cone was made by making a large circle out of craft foam and cutting out a small wedge. I kept checking the cone size, and made the wedge larger until I was satisfied with the size. Now, for my final helmet, I used a store bought mask. Holding it in place, I traced along the inside where it would sit. Then, I used a dremel to hollow these areas out. Then, using contact cement, I glued the mask in place. Then I used wood filler to smooth the transition between helmet and mask. Bracer time. This was probably the easiest element to make. I traced my arm onto a piece of waxpaper, sketched out the armor, then used it as a base to cut out my foam pieces, making sure everything overlapped. Seal, paint, prime. Then, using the overlapping armor technique from Evil Ted's male armor tutorial, I attached them to each other. Left over belts from my Furiosa cosplay were utilized to create straps. Shoes. I bought a pair of clog like shoes from a thrift store for a few dollars, then modified them. Using paper, tape to the shoes and make your designs. Use templates to cut craft foam and use contact cement to glue in place. Mine were backless, so I first added a back. Once happy, glue in place. Next, I used a sewing measuring tape and measured the opening for the cuff piece. I actually ended up not being happy with this bit and wish I would have worked on it a bit more. I could see directly into my shoe when I looked down. I don't think it was noticeable to anyone else. Sketch out the wings. Check that the size works, then cut out of foam and glue. That's it for the armor tutorial! I hope this helps! I will also make a breakdown post that gives information of what sewing patterns I used for the pants, how to make the pattern for the shirt, how I made the skirts and belt, and the tutorial I used for my cape. 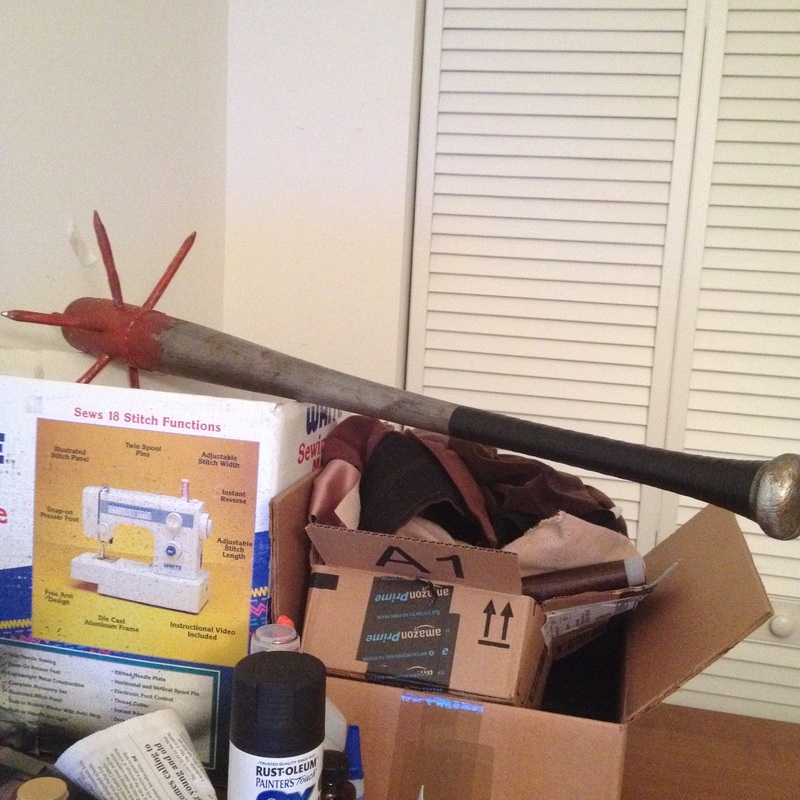 I'll conclude with a full tutorial for my hammer.